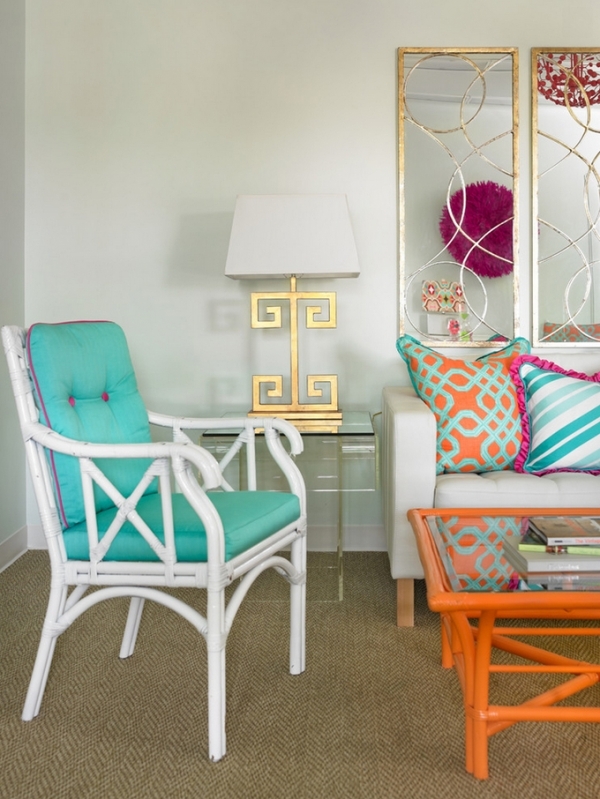 This home has a wonderfully vivid interior filled with gorgeous turquoise and orange. Pinks and greens also flow throughout the space, complementing and enhancing the gorgeous decor. In the first seating area a beautiful gold mirror creates a fantastic focal point for the space. The mirror is framed by a bright pink ceiling decoration. 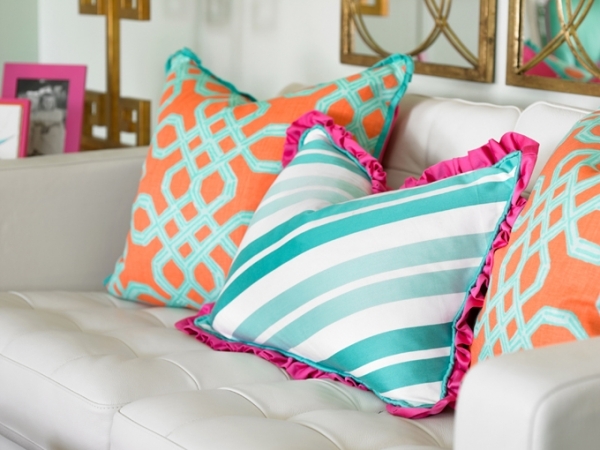 A white sofa with patterned pillows, and white chairs with turquoise cushions, provide seating. 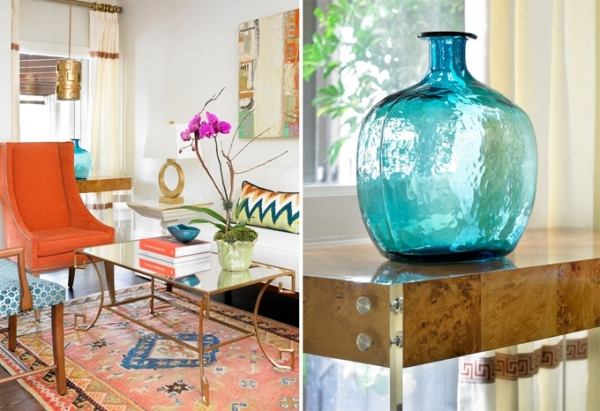 The bright orange table is absolutely stunning, and the gold lamps are a wonderful addition to this vivid interior. 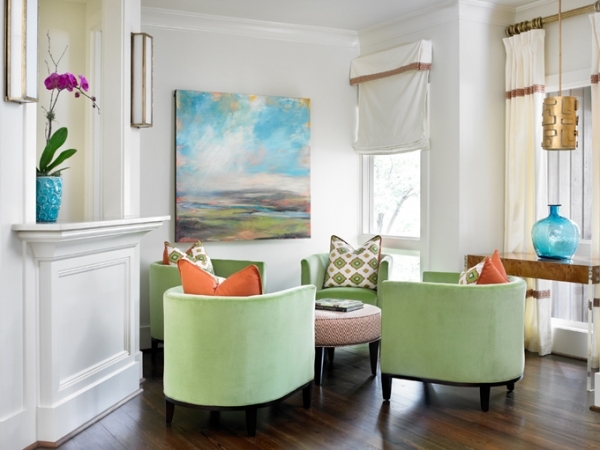 The office in this wonderful home continues the color palette found in the first seating room. It is a bright space with fantastic wall decor. The furniture is white and clean-lined, providing a wonderful backdrop for the exciting design. The green table has fantastic details, and the orange one is perfectly placed. The second seating area is magnificent. 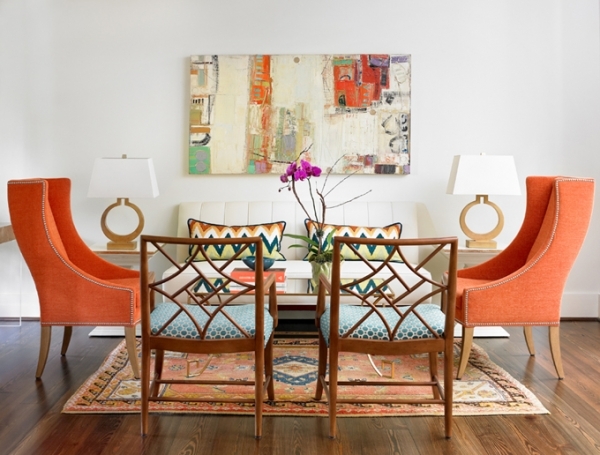 Orange chairs, wooden chairs, and a white sofa, make up the seating in this space. 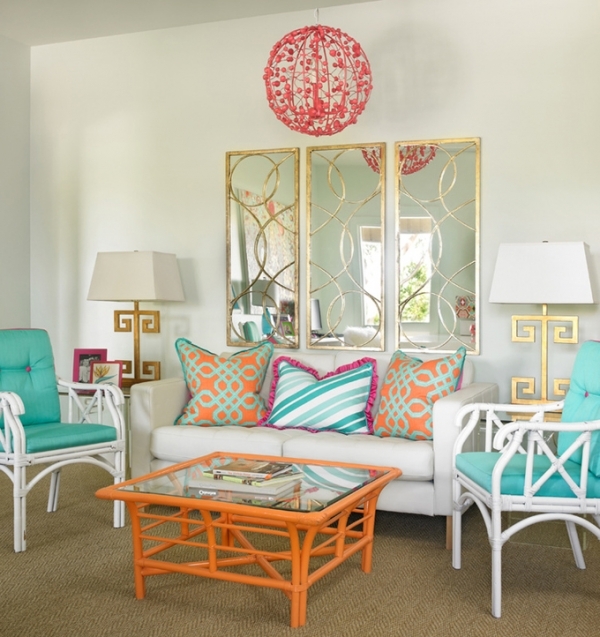 The orange chairs are phenomenal, and the pattern on the wooden chairs adds the cool turquoise into the room. The white walls sit in opposition to dark hardwoods, fashioning a fantastic contrast. An out of this world abstract artwork and two gold lamps, frame the space, creating a very picturesque living area. Lastly, there’s the third seating area in this vivid interior. 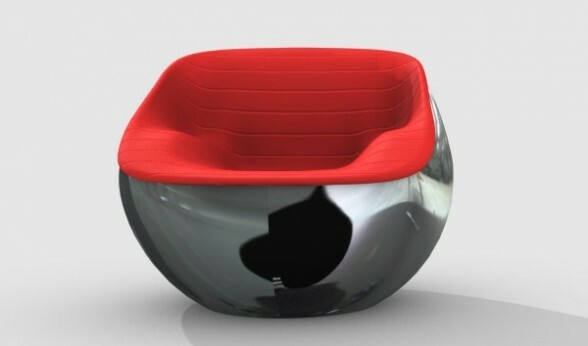 The design creates an inviting, bright, and peaceful atmosphere. 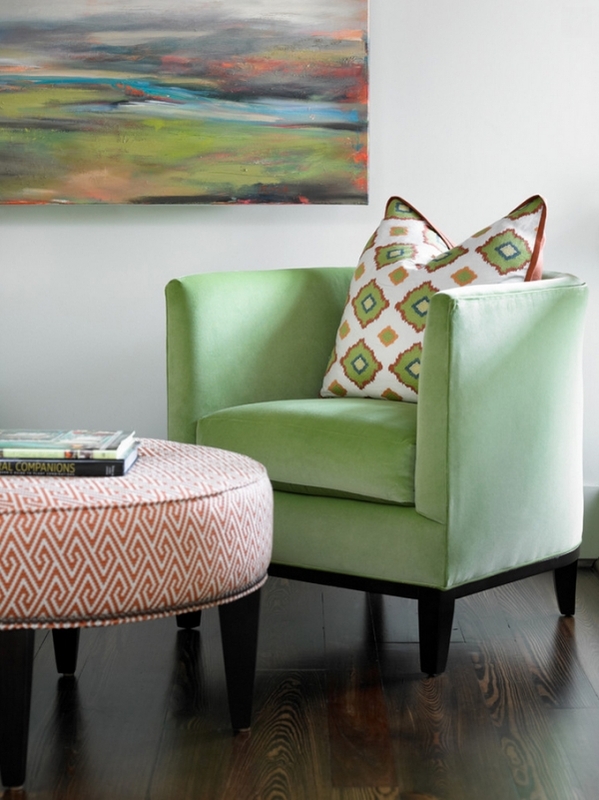 There are fabulous green chairs, with wonderful pillows, and a fantastic ottoman, used as a table. The large windows allow the light to shine into the space, the white walls provide a backdrop, and the dark hardwoods anchor this cozy spot. This vivid interior is completely bewitching. The color palette and the design are tastefully done. The decor accents add glamour and fun. And the artwork fits in perfectly with the rest of the decor, adding a polished touch.